Companies should certainly move toward imaging and digitization when feasible but the best solutions always require a sophisticated approach to rebuilding processes that recognize both opportunities, limitations and human nature. Over the past thirty years, many people have proclaimed the imminent arrival of the paperless office. Yet even the World Wide Web, which allows almost any computer to read and display another computer’s documents, has increased the amount of printing done. The use of e-mail in an organization causes an average 40 percent increase in paper consumption. 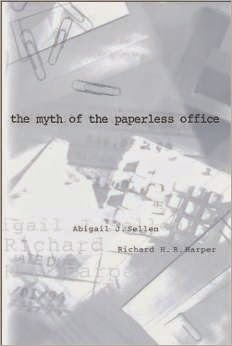 In The Myth of the Paperless Office, Abigail Sellen and Richard Harper use the study of paper as a way to understand the work that people do and the reasons they do it the way they do. Using the tools of ethnography and cognitive psychology, they look at paper use from the level of the individual up to that of organizational culture.Central to Sellen and Harper’s investigation is the concept of “affordances” — the activities that an object allows, or affords. The physical properties of paper (its being thin, light, porous, opaque, and flexible) afford the human actions of grasping, carrying, folding, writing, and so on. The concept of affordance allows them to compare the affordances of paper with those of existing digital devices. They can then ask what kinds of devices or systems would make new kinds of activities possible or better support current activities. The authors argue that paper will continue to play an important role in office life. Rather than pursue the ideal of the paperless office, we should work toward a future in which paper and electronic document tools work in concert and organizational processes make optimal use of both.